Shared by Peru and Bolivia, Lake Titicaca is regarded as the world's highest navigable lake. It lies 12,580ft (3,825m) above sea level, and covers 3,200 square miles (8,300 sq km). Nature lovers will encounter clear water and numerous islands. History buffs can enjoy an area that is rich in Incan history. Indeed, the region's indigenous people hold the lake and its two islands in high regard, as they are the mythical sites of the Incan people's creation. The islands are called Islas del Sol (Island of the Sun) and Islas de la Luna (Island of the Moon). Copacabana is the area's main town and a base for exploring the islands. Boats ferry visitors across every day. 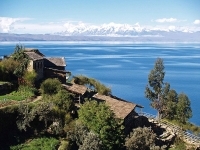 Views from the islands take in the lake and the looming, snow-capped peaks of the Andean range. The islands themselves are incredibly picturesque. Culturally speaking, the friendly locals have retained their traditional way of life. Fishermen sail by on handmade reed boats, while llamas and alpacas are herded along the mountain paths to villages scattered on the hillsides. Visitors will find a few Inca ruins, among them the Sun Temple and the Chincana complex on Islas del Sol, and Incan stairways. They can also spend a night on one of Islas del Sol's pretty guest houses, experiencing local hospitality, and appreciating a breath-taking sunset.